Removable dentures have been around for a long time. Perhaps your grandparents had them — maybe their grandparents did too. George Washington owned several sets, and they seemed to work OK… and millions of Americans are wearing full or partial sets today. Is there a reason why you shouldn't wear dentures? Yes… but first, a little background. At one time, dentures were the only answer to the problem of complete or partial edentulism (the loss of natural teeth). Today there's a better answer: Dental Implants. 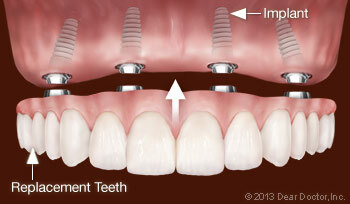 But before we look at implants, let's examine removable dentures in a little more detail. Dentures are certainly a time-tested technology that many people have learned to live with. Their initial purchase price is relatively inexpensive, and after a period of adjustment, many find they function adequately. But just as dentures themselves are familiar, so are the difficulties that denture wearers experience. Removable dentures frequently require special cleaning, and they can build up unpleasant tastes and odors. Because they aren't always reliable during use, it's common for dentures to lead to a loss of self-confidence and self-esteem. Often, they don't allow you to eat the foods you really like. Also, dentures invariably need to be re-fitted and re-made over time. While the first two sets of problems may be enough to turn you away from dentures, it's the last two that give reasons to be concerned about your health. In recent years, the importance of proper nutrition has received plenty of well-deserved attention. 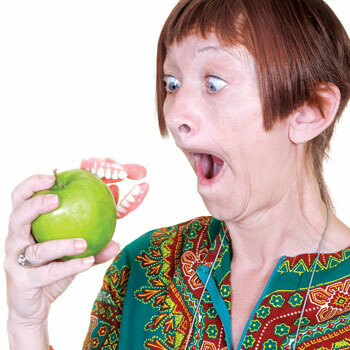 Here's something to note: Wearing dentures can be detrimental to good nutrition. Studies have shown that half of all denture wearers avoid many “difficult” foods (like raw fruits and vegetables, which have proven health benefits), while 29% can eat only soft or mashed items, which are often “processed” or “junk” foods. In fact, 17% say they eat more efficiently without their dentures! For many older Americans, eating healthier is a major goal; it has been recognized as a great way to prevent disease and improve overall wellness. Dentures can make it harder to achieve that goal. They also create their own problems, which are related to bone loss. 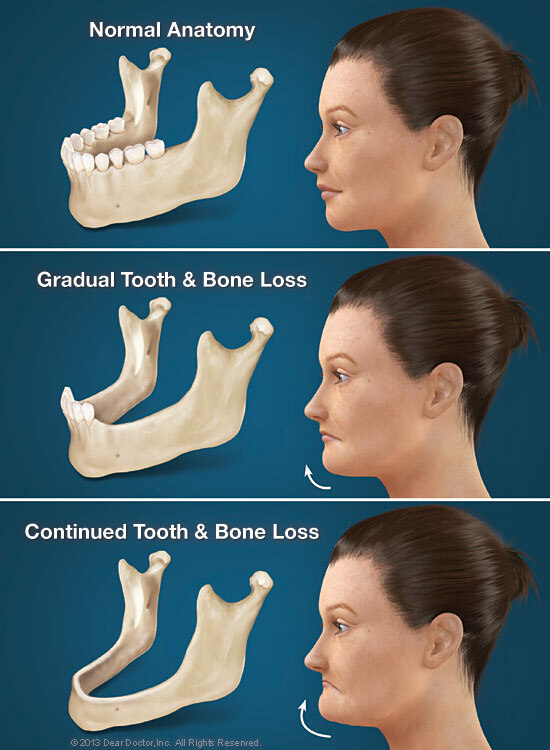 When you lose teeth, the bone tissue in the jaw, which formerly surrounded them, inevitably begins to deteriorate. It rapidly loses volume, becoming narrower and shallower — and as it does so, the appearance of the face changes too. The decreased distance between chin and nose, and the frowning countenance caused by a loss of support for the cheeks and lips, makes a person look aged and unhappy… even if they're not (View Example). Dentures don't stop the loss of bone; in fact, they accelerate it. By placing pressure directly on the bone's surface, rather than into the bone structure beneath it, they actually speed up this destructive process. The reason dentures need to be re-lined or re-made is because bone loss is changing the contours of the jaw. And the consequences of wearing dentures aren't just skin deep: Thinner bones are more prone to fracture, and other associated oral health issues (such as TMJ problems) may become a concern. Today, there's a better alternative to dentures: dental implants. Because the remarkable technology of implants allows them to fuse with living bone tissue in the jaw, they provide the stimulus needed to keep the bone from eroding. In turn, because they're anchored so solidly, they function much better than dentures: You can eat any of your favorite foods, or try something new — the same way you would with your natural teeth. 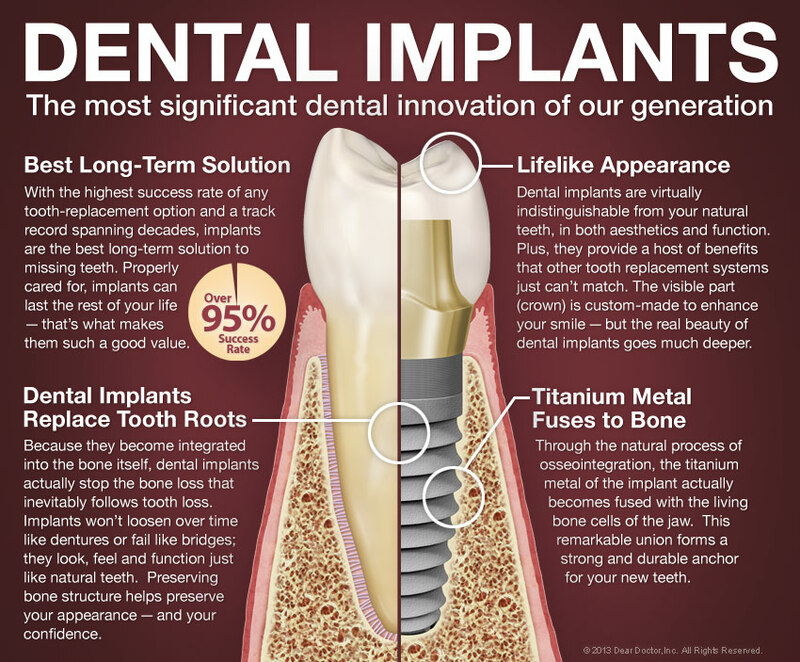 The dental implant procedure has a success rate of over 95 percent. Implants require no special care beyond normal brushing and flossing; they won't decay or stain, and they're designed to last a lifetime. While their initial cost is usually higher, implants offer something dentures don't — long-term value. And the enjoyment and self-confidence many people regain with dental implants is something you can't put a price on.